With the “official” start of sea turtle nesting season, the City of Sanibel, in partnership with the Sanibel-Captiva Conservation Foundation (SCCF), is asking all residents and visitors to do their part in protecting these threatened and endangered species. On Sanibel, nesting and hatchling emergence typically occur between May 1 st and October 31 st , although monitoring will begin on April 15 th as per Florida Fish and Wildlife Conservation Commission guidelines. The nesting ritual of the loggerhead sea turtle is one of the most remarkable natural phenomena occurring on Sanibel’s Gulf beaches. This natural process has happened on Sanibel for centuries and our eleven miles of Gulf shoreline have more nesting activity than any other beach in Lee County. Sought by predators and susceptible to dehydration, sea turtle hatchlings have only a one in one thousand chance of survival. Human activities can further reduce that chance. As a reminder, the City’s beachfront lighting standards are applicable and enforced year-round . 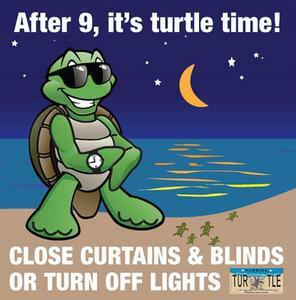 Gulf-front property owners should make sure that their properties are in compliance with the City’s sea turtle protection ordinances and ensure that artificial lighting from the property does not illuminate the beach (Sanibel Code Section 74-181—74-183, Section 126-996—126-1002). An easy way to test if your property is in compliance is to stand on the beach on a moonless night and look seaward. If you can see your shadow cast towards the water, there is too much light behind you. This light could potentially deter female turtles from nesting or disorient hatchlings as they emerge from the nest. In 2017, a record number of nests were laid on Sanibel for the fourth year in a row. Of the 650 nests laid, over 501 hatched, and it is estimated that over 43,000 sea turtle hatchlings successfully made their way into the ocean! We look forward to another successful sea turtle nesting season and hope to uphold Sanibel’s reputation as having one of the darkest and most “turtle friendly” beaches in the state. We ask for your continued compliance with City’s sea turtle protection ordinances and remind all residents and visitors that violations of these ordinances may be subject to City, State, and/or Federal fines and penalties. Violations should be reported immediately to the Sanibel Police Department at (239) 472-3111, Sanibel Code Enforcement (239) 472-4136, or Natural Resources at (239) 472-3700.